Much more compact in growth habit than the King White Shahtoot. 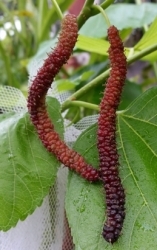 These delicious sweet fruits can reach 10cm in length. 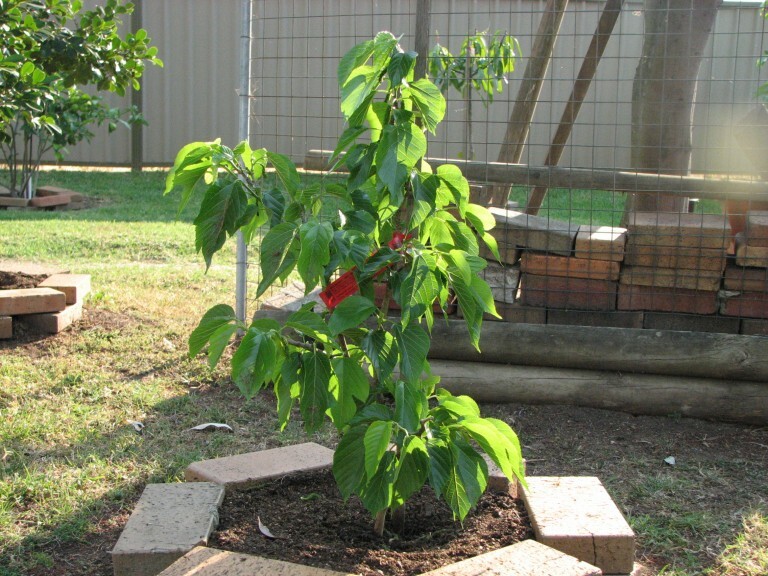 Ideal for back yards and we consider it a must have fruit tree for the back yard. 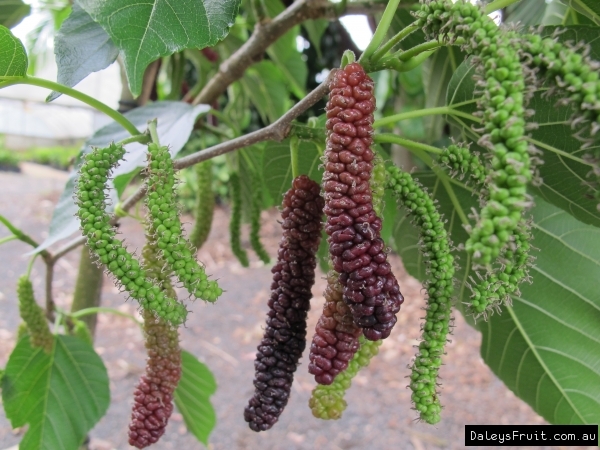 The best way to eat mulberries is fresh from the tree but if some should make it to the kitchen bench they make excellent pies, jams, wines and sauces. 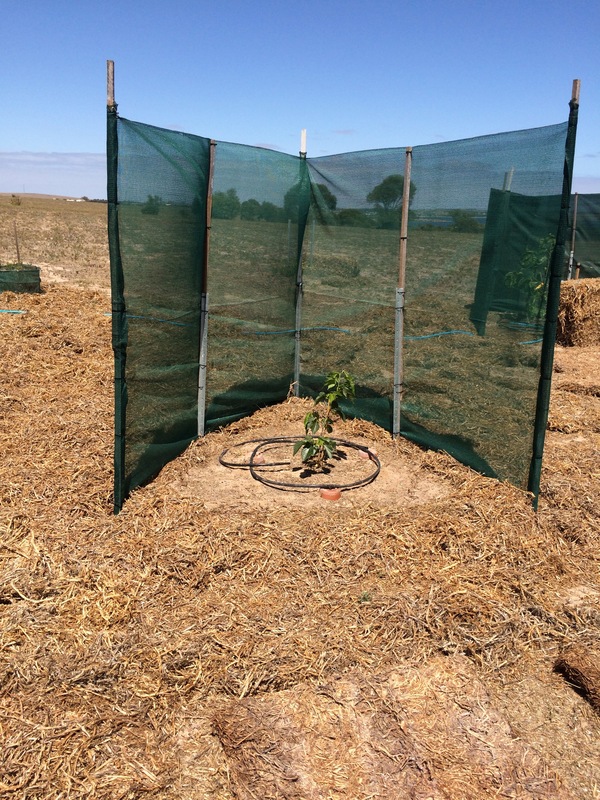 Multiple crops are possible by pruning directly after your first crop. 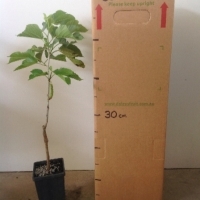 Suitable for most regions of Australia, although it can be susceptible to damage from late frosts. 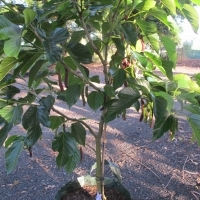 The red shahtoot is ideal for growing in pots and containers due to it small growing habit and it is ideal for school gardens as it does not produce fruits that stain and the sweet fruits are very appealing to children. 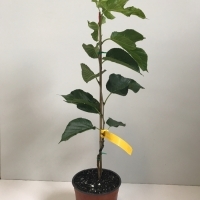 This variety is best suited to warm subtropical climates and does not perform well in temperate climate where it tends to drop their fruit. I love the fruit they are always nice, sometimes fruits 2 times yum. likes perth climate. possums broke the tree this year grrrr think it might survive. Slow to establish but beginning to show stability in growth. Purchased from Daleys. 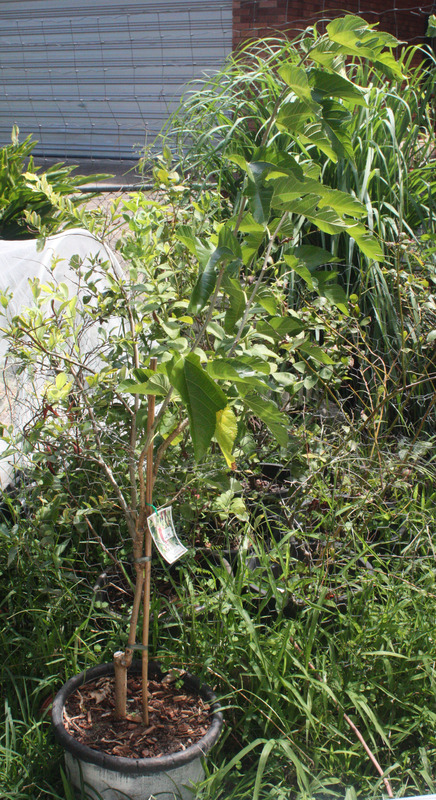 September 2009: Some growth recorded. All fruit has dropped before maturing. 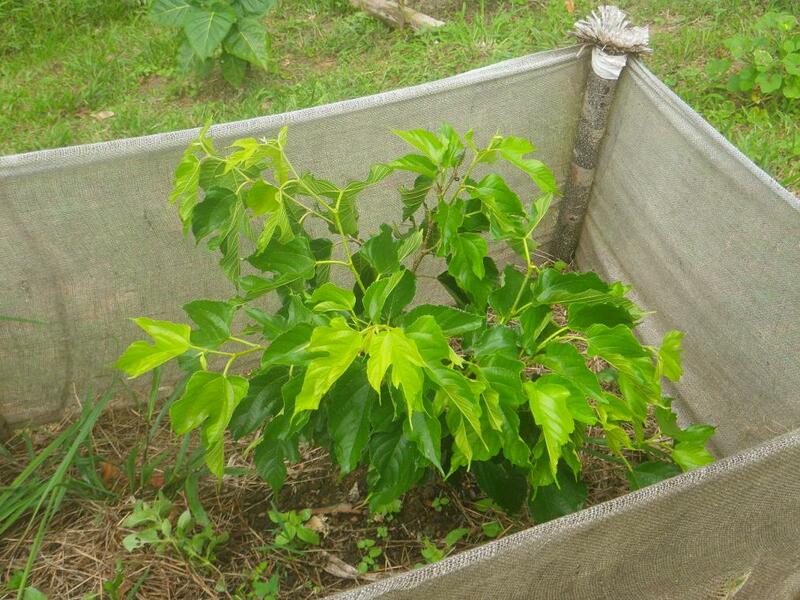 Perhaps its nature's way of emphasizing on plant growth instead of fruit production. Applied sulphate of potash and watered in. More growth recorded. 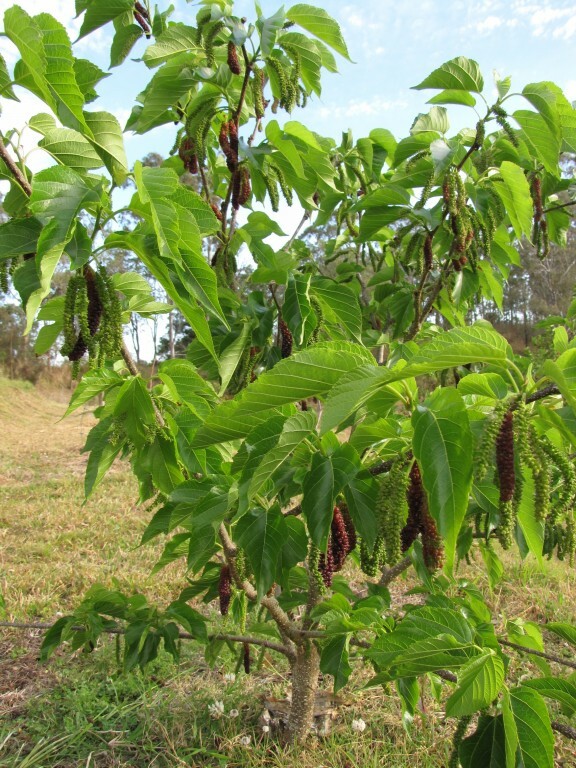 October 2009: More growth recorded but all fruit has dropped. November 2009: More growth recorded. No fruiting activity. December 2009 to February 2010: Not much growth this period. Some fruiting activity but fruit drops before ripening. 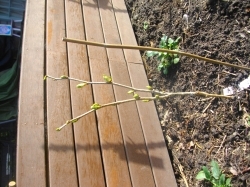 March 2010: No growth recorded. Some fruit on plant waiting to ripen. October 2012: Is slightly higher by about 30cm today, more established with thicker stems and branches. 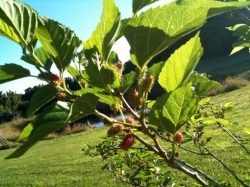 Producing bigger and juicy mulberries. Lime sulphur spray in winter and pest oil mid spring. 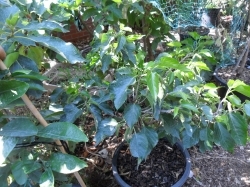 Great fruit, grows well in a pot, appears to be difficult to kill! Just planted november 2009 but already doubled its size. Great expectations. Looking great and growing beautifully. Got two very late mulberries off this tree. I am looking forward to a full crop - hopefully it will start fruiting soon. 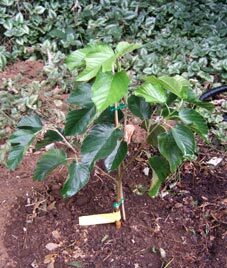 Dec 2010: Plant is already bearing about 1/2 dozen fruits, hope they don't drop off prematurely like a few of my persimmon trees. Oct 2010: A branch was broken when I opened the parcel but all is fine. 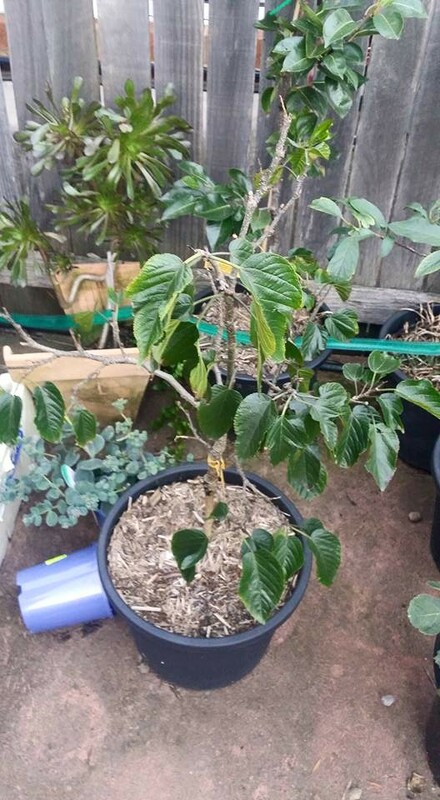 The tree is now planted into 25cm pot, will plant in the ground autumn/spring next year. Can't wait to taste the fruit. 2016only 1.5m tall but just as wide. great tasting fruit. a dwarf is a good size to net if you have bird problems in your area. 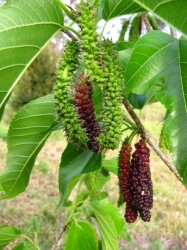 the thing about mulberries is they must be left on tree to ripen but only a couple ripen each day and the birds are up early. if your tying nets over trees and have to remove them each day for 1 or 2 it gets tiresome. 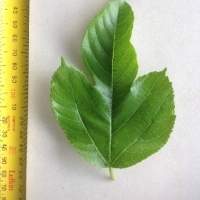 but in areas with low fruit eating bird populations, a hardy small tree. Planted in winebarrel, 6 months and just coming alive with lots of fruit so i can`t wait..
Love the large green leaves and looking forward to sampling the fruit of course! 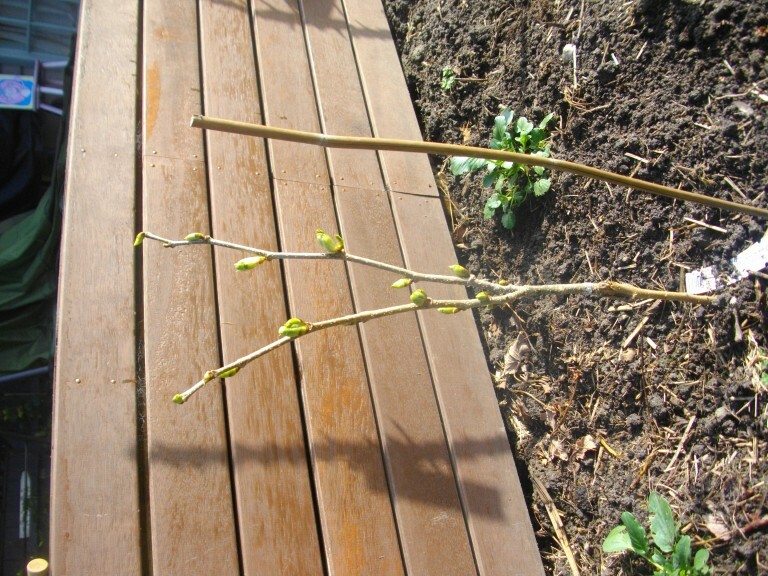 Also, being decidous I hve planted next to our deck to provide shade in summer but let in the winter sun. Hope it grows a lot more this spring onwards. Jan 2014- In a pot, does not grow due to bad graft. Does provide a few lovely sweet mulberries each season. 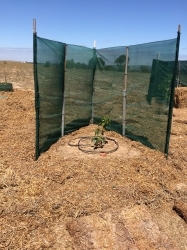 Now planted out, doing well, fruits readily, needs water. I like the taste and look of the fruit. 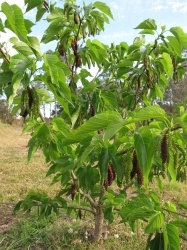 Just started shooting and fruiting and I am excited in anticipation of tasting this amazing looooong mulberry. Everyone who see the size of the fruit is impressed. I hope the taste matches the size and length of this fascinating fruit tree. 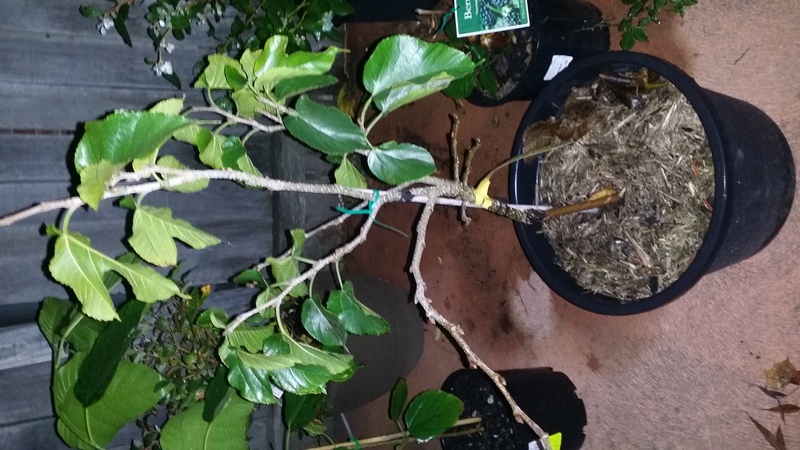 I will transfer this tree into a large winebarrel soon. Hopefully,it will be a prolific bearer like the white shahtoot. I've eaten it's berries and they taste like honeyed rasberries. 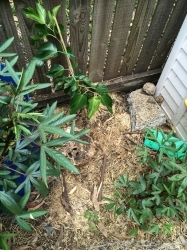 Planted in the front lawned area. Heavily mulched. First fruit Dec 2009. Tasty but not many. 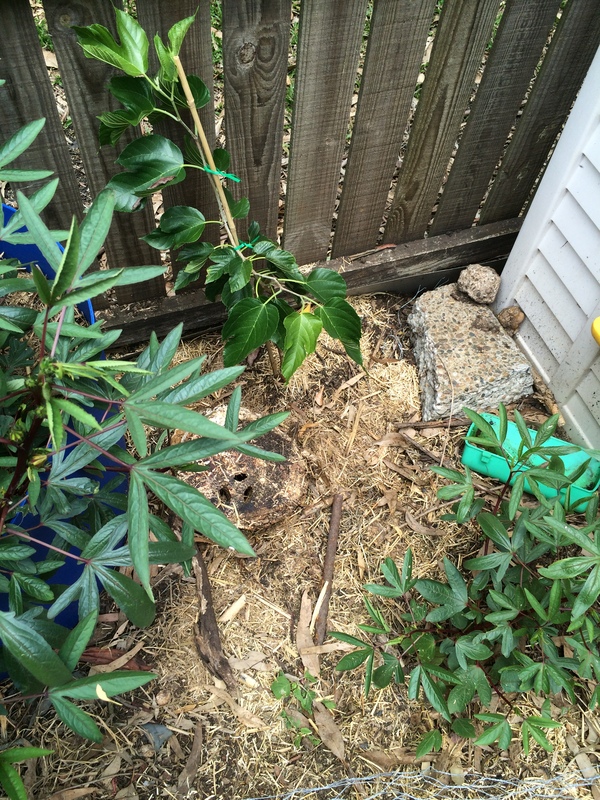 Council removed it from the narrow kerbside nature strip. Growing very well if the possums would leave it alone! One of my favourite fruits. I have fond memories of the one growing in my backyard in Sydney. We froze the ripe berries and made fruit ice-cream from them. 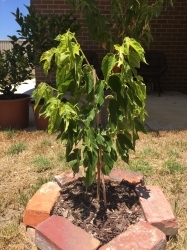 This one is still a young tree. 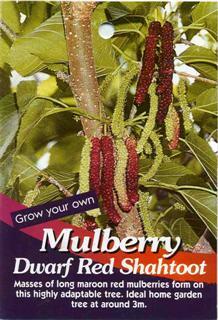 Comments: - Have always loved mulberries but decided to try this new variety. Will keep you posted. 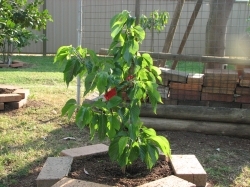 Comments: - Have always wanted a mulberry tree but was worried about the staining. Now I just need to find somewhere to plant it. This one fruits every year and it very nice to watch. 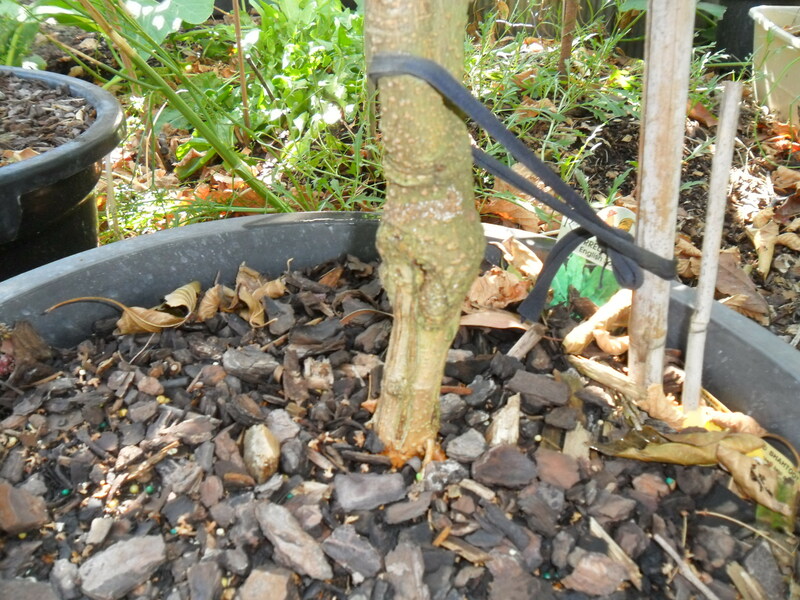 Comments: - First fruited within a year, now 4 years young. Keeping it trimmed to 2.5m. Trim lightly a couple of times in summer for a smaller second harvest. Espaliers well. Saw a small harvest in Feb/Mar after light trim in January. 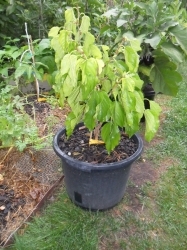 purchased from daleys 11/1999 still in a pot fruit is nice to eat but I think a larger pot would improve yeild? Comments: - IT has heaps of fruit on it this year.